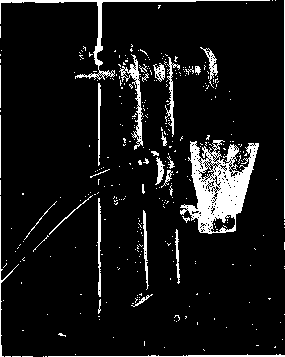 Fitted with forward, stop, and reverse action and controlled by a safety stopping lever, the Atlas comes supplied with two pairs of change wheels which will cut a range of lengths from I/, to % inc h. The output for t/t inch lengths ranges from 7 to 15 hundredweights per hour, depending upon the blades used. R. Hunt & Co., Ltd. Atlas Works, Earls Colne Colchester, Essex COG 2EP, U.K. This unit works coupled to the three-point hitch of a tractor or powered by a stationary engine—electric or fuel. It is a combination hammer mill-silage chopper capable of producing from 220 pounds of fine corn flour to £ tons of chopped grass in an hour. 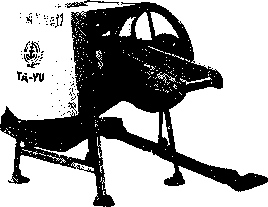 The Ta-Yu Silage Cutler and Potato Slicer is treadle-powered but can be operated with a i/i to % h.p. motor. It weighs 84.6 kilograms, measures 27 by 34 by 39 inches, and produces at a rate of approximately 300 to 500 kilograms per hour. The chopping length of this unit varies from il to 51 millimeters utilizing a 2.5 to 4.0 h.p. motor. It has a capacity of up to 4.9 tons per hour. This power unit comes in four models rang-j ing in power requirement from \/\ to 2 h.p. for | output capncitics of 300 to 800 kilograms per I hour. T he cut is b flv adjustable, and the j blades are made of sheer steel for long-lasting | sharpness. Af/m-p of the early /wnn r-operaled silage cutlers received their pcwer from a I'Jjelt and pulley arrangement from a tractor bower-take-off shaft. This model has a conveyor for delivering ensilage to-a high bin or into a leu von. knives '»re easily removed for sharpening and the shear-cutter-bar lias double cutting edges which can be reversed when one side is worn out. The root and vegetable cutter is a very simple tool for slicing potatoes, turnips, sugar beets, carrots, and other root crops into small pieces suitable for animal feed or compost, it is not designed to handle branches or heavy brush. In practice, tfie hopper is filled with semihard fruits or vegetables which are then sliced and shredded by ihe action of a heavy, cast-iron wheel with a number of small cutters\attached to it.